Step up in style by wearing leather dress shoes that have more fashion packed than some people can handle. Giorgio Brutini makes just the style shoes that you need. Featuring Italian sharp looks that will turn heads, these dress shoes have it like nothing else. 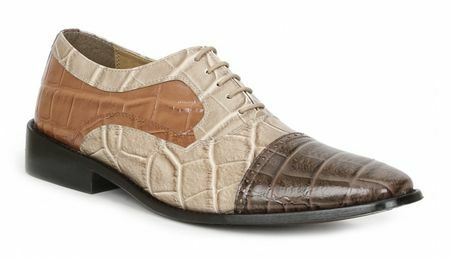 These brown multi color alligator texture shoes are made of gator texture uppers that look ready for a good time. Featuring a Italian style, these shoes tell you that they are for the style minded man. If you have a dark brown fashion suit, these shoes will look simply stellar with it.